At its annual conference on September 20th, Maine Genealogical Society was pleased to recognize Bob Chenard’s contributions to the genealogical community. He was presented with the 2008 Award of Excellence in Genealogical Service. We’re looking for nominations! This is the time to help recognize that unsung genealogical hero who has contributed to your research success. maintaining genealogical website(s); and promotion of genealogy. 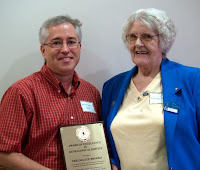 Maine Genealogical Society at its conference on September 22, 2007, presented Thelma Eye Brooks with new Award of Excellence in Genealogical Service, in recognition of her years of service in the areas of society volunteerism, teaching and writing. Among her many accomplishments are the publication of the Hermon Roots newsletter from 1989-1999; authorship of a book on 3 generations of early Calais families (published by Heritage Books); and the self-publication of 13 books (5 family books and 8 funeral home records). She also wrote a column “Roots and Branches” which appeared regularly in the Kennebec Journal and Morning Sentinel for 15 years. Thelma has served as president, vice-president and secretary of Taconnett Falls Chapter of MGS, where she has also served on their library committee since 1990 and has served as its chair since 2000. Thelma has taught classes on genealogy, coordinated historical and genealogical research with the Waterville Public Library, and has been a frequent speaker for many genealogical and historical societies. More than any of these specific accomplishments, the most wonderful thing about Thelma is that she is always willing to share her knowledge and experience with everyone. She is always a “can do” person and works tirelessly for Taconnett Genealogical Library, the chapter, and genealogy researchers everywhere. Maine Genealogical Society honors her extraordinary contributions to the Society and for advancing the field of genealogy in the State of Maine. Start A Chapter Near You! We encourage the formation of new genealogical groups in the state. If you would like assistance or more information about becoming an official chapter of MGS, please contact our president, Carol Prescott McCoy, Ph.D.